Dear Bill, Thank you for such a quick answer to my last letter, I could not believe how fast you wrote me back. This last letter was an eye-opener for sure and the book The Power of Patience was off the chart. Wow, it really made my day. You would think you have someone listening in to our conversations. Well, I guess you do don’t you? I also want you to know I’m sending my family everything you’re sending me. God bless you. Dear Bill Street, I’m new to your ministry because I’ve never written to you before now. I know several fellow inmates here who are writing you and they are really being helped. I would like to receive some of your letters and teaching because I need to know more about God before I make a commitment to follow him. I don’t know him well enough to surrender all my heart to him. I trust you will understand where I’m coming from. I am ready to hear what you have to share about God and hopefully I can come to salvation through your ministry. Dear Mr. Street, How are you doing? This is certainly a pleasure to speak with you. I was assured you read every letter you receive so here goes. I came to accept Jesus as my savior last night because of your story in A Voice Behind Bars. This testimony really encouraged me to make a change in my life and get right with God. I did that sir and just wanted you to know that. I’m sending this commitment card to you asking for your spiritual help. Thank you and write me back as soon as you can. Dear Bill and Mid-America Prison Ministry, I’m a convert today because of you and the book you wrote called You Can Reign In Life! My cell mate has been writing to you for a number of months now and he said, you got to read this little book. I did and now I’m a believer in Jesus. This book was so interesting I couldn’t put it down. Thank you for sharing your work with us. Put me on your mailing list for sure. I’m ready to receive and grow. Dear Bill, I greet you from my heart today and would ask that you pray for me. I read your life story today in a book about behind bars. This book really moved me to tears. I want God to turn my life around like he did yours. Is that possible? I’ve done a lot of really bad things and I don’t think there’s any hope for me. I prayed the prayer you had written in your book and I want to be a good person now. Do you have anything you can send me to help me? Thanks. Dear Mr. Street, Hi, my name is Calvin and I’m currently in the Creek County Jail here in Sapulpa, Oklahoma. I read a book by you that really changed my way of thinking about God. It’s called How To Get Out Of Prison and Stay Out. I’ve never read anything, like this before. I didn’t believe there was a God ‘till today. I can truly say this book saved my life. Thank you for writing and sharing this teaching with me. Can you send me any other materials you’ve written, I need to learn more about the God you know. Dear Bill, Some people came to my cell today and gave me a copy of a book called, A Voice Behind Bars, I read it and now I’m asking you to pray me into heaven. I don’t want to die and go to hell forever. Will you do that for me? Thank you. Dear Brother Street, A big hello from Wailuku. This last book you sent called Are You Plugged in to the Real Power was terrific. That’s the best one so far. I’m growing so much through your ministry. Don’t ever stop. Keep praying for me. Dear Bill, The ministry you are providing to prisoners is beyond belief. I’m writing to give testimony to those helping you do what you do. I’ve been writing to you for 7 years now and I’m not the same man I once was. The material you send out is overwhelming and powerful. I’m now one of your Cell Group Leaders here. Dear Rev. Street, My given name is Jason, but everyone calls me Jay. I was invited to attend a group meeting yesterday concerning addictions. 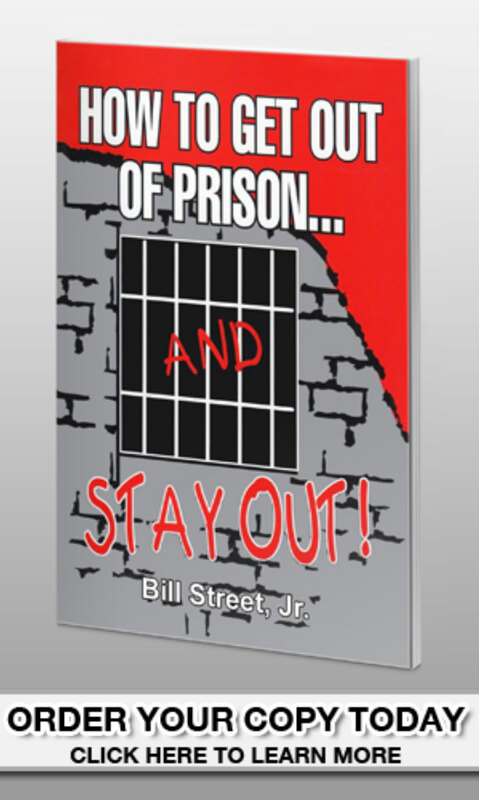 They were using a book called How to Get Out of Prison and Stay Out as the teaching manual. At the end of the meeting they prayed for everyone and I was really touched. I want to get right with God. Can you help me accomplish that? I’m very serious. Thank you. Dear Mr. Street, I greet you from cell block D. My name Sorone and I appreciate so very much sir your most valuable collection of books I found in the library. I’ve read 12 of them so far and I can’t put them down. Man, you got it going on. Send me two copies of everything you have in print, I’ll give one copy away, I’m now a Christian. I was a Muslim. Write back if you can. I’ll answer every letter you send me. Thank you. Dear Bill, I’ll make my comments brief. The message in your get out book changed my life forever. I can’t add anything to that. I’m on a new road, headed in a new direction now thanks to you. Keep doing what you’re doing and we all thank you. Dear Bill, The book Behind them Bars got to me big time. Today I felt as though I got a new sentence, life with Jesus! I knew I had to get right with the man upstairs and I did. See ya in heaven. Enclosed is my commitment card. Write me back this week. Dear Mr. Street, My Aunt sent me the book How To get Out Of Prison. All my questions have been answered now. See you at the throne my brother and thanks for your work. Dear Bill, I’m writing to let you know God won. I gave my heart to him today in my cell. Your story in A Voice Behind Bars spoke to me in a powerful way. Thank you and count me in.